Seven Visual Arts students at The Sixth Form College, Solihull have had their talent and hard work rewarded prizes from the Arden Decorative & Fine Arts Society (Arden DFAS). 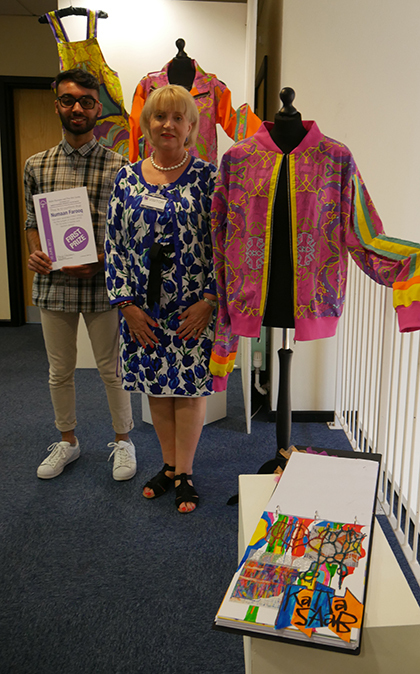 Numaan Farooq (aged 18, from Birmingham), a former Ninestiles Academy student now studying BTEC Art & Design, won First Prize for his textiles artwork, which included brightly coloured fashions. Three students shared Second Prize, which were Chloe Griffiths, Abigail Parker and Lauren Turner, while three further students were highly commended and they were Tom Allen, Samantha Farrell and Anas Uddin. Chloe Griffiths (aged 18, from Shirley) is also a BTEC student and her paintings of wild animals (gorilla, lion and leopard) are what impressed the judges. Meanwhile, A level Fine Art student Abigail Parker (aged 18, from Marston Green) was rewarded for her abstract paintings of faces and fellow Fine Art student Lauren Turner (aged 17, from Knowledge) produced a trio of paintings that incorporated piece of broken mirror in the artwork. The three highly commended students were given prizes too. Tom Allen (aged 18, from Birmingham) produced still life paintings for his BTEC coursework, while Samantha Farrell (aged 18, from Birmingham) did framed portraits and Anas Uddin (aged 18, from Birmingham) produced a woodland scene with paint and sculpture. Like Tom, Samantha and Anas produced their artwork as part of their BTEC Art & Design course. All the successful students have received cash prizes from Arden DFAS and were presented with their prizes at a ceremony on Friday last week. Representatives from the Arden Decorative & Fine Arts Society were on hand to give out the prizes.